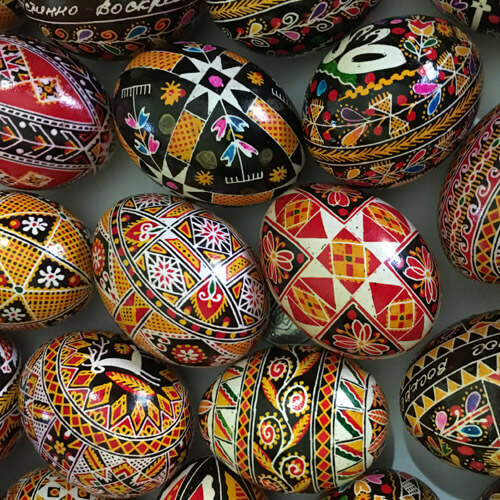 Following last year’s trip to Ukraine, we are bringing some of Ukraine to Ledbury this March with a Pysanky Egg Workshop and Traditional Ukrainian Lunch held at Tinsmiths and run by Nataliya Cummings (Experience Ukraine) and Helena Orlowski. 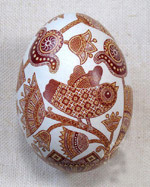 Traditional Psanky Eggs from Ukraine showing traditional motifs. 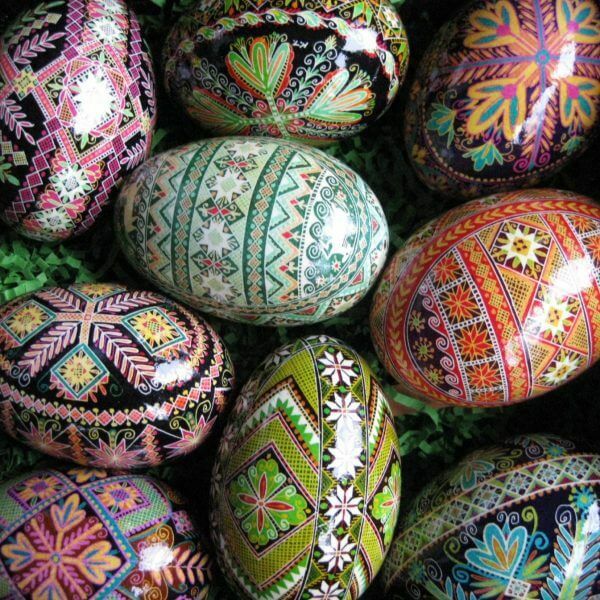 The tradition of decorating eggs using hot wax resist (Batik) techniques dates back to pre-Christian times and The Hutsuls––Ukrainians who live in the Carpathian Mountains of western Ukraine––believe that the fate of the world depends upon the pysanka. As long as the egg decorating custom continues, the world will exist. If, for any reason, this custom is abandoned, evil––in the shape of a horrible serpent who is forever chained to a cliff–– will overrun the world. Each year the serpent sends out his minions to see how many pysanky have been created. If the number is low the serpent’s chains are loosened and he is free to wander the earth causing havoc and destruction. If, on the other hand, the number of pysanky has increased, the chains are tightened and good triumphs over evil for yet another year. Colours and symbols are specific to a region and family and these are passed from Mother to daughter. The blessed eggs are given to relatives and respected community members as a talisman against bad fortune in the coming year. A good number are placed in specific places around the house and with livestock to ward off evil and secure fertility for the coming season. Young women would present an egg to eligible batchelors in their community – the antidote to online dating! One example of many, Birds, were considered the harbingers of spring, thus they were a commonplace pysanka motif. Birds of all kinds are the messengers of the sun and heaven. Birds are always shown perched, at rest, never flying (except for swallows and, in more recent times, white doves carrying letters). Roosters are symbols of masculinity, or the coming of dawn, and hens represent fertility. Very many of these symbolic motifs appear in the folk embroidery and textiles of the Ukraine. Once a design is settled on colour has to be seriously considered as it carries its own meaning ie. Red – is probably the oldest symbolic color, and has many meanings. It represents life-giving blood, and often appears on pysanky with nocturnal and heavenly symbols. It represents love and joy, and the hope of marriage. It is also associated with the sun. Black – is a particularly sacred color, and is most commonly associated with the “other world,” but not in a negative sense. Yellow – symbolized the moon and stars and also, agriculturally, the harvest. Blue – Represented blue skies or the air, and good health. White – Signified purity, birth, light, rejoicing, virginity. Green – the color of new life in the spring. Green represents the resurrection of nature, and the riches of vegetation. Brown – represents the earth. Black and white – mourning, respect for the souls of the dead. Black and red – this combination was perceived as “harsh and frightful,” and very disturbing. It is common in Podillya, where both serpent motifs and goddess motifs were written with this combination. Four or more colors – the family’s happiness, prosperity, love, health and achievements. 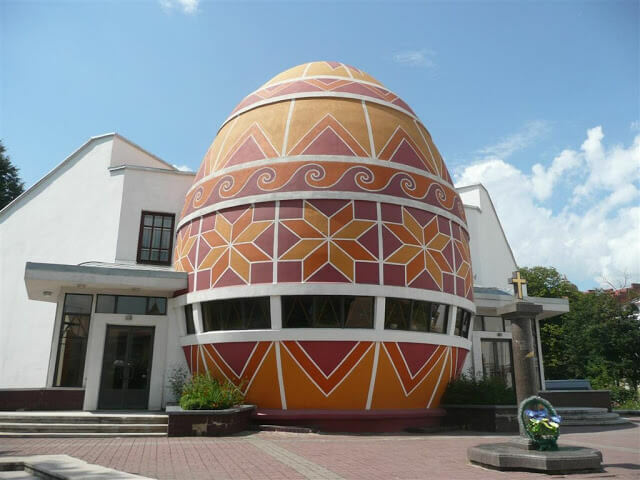 For an opportunity to see all the colours, motifs and combinations you couldn’t do better than to visit the Psanka Museum in Kolomyya where you can see 6000 of the best examples of Psanka not to mention it’s eggcentric building design. Pysanky means writing or to write and the eggs are decorated using a wax resist method. Beeswax was heated in a small bowl on the large family stove, and the styluses were dipped into it. The molten wax was applied to the white egg with a writing motion; any bit of shell covered with wax would be sealed, and remain white. Then the egg was dyed yellow, and more wax applied, and then orange, red, purple, black. (The dye sequence was always light to dark). Bits of shell covered with wax remained that color. After the final color, usually red, brown or black, the wax was removed by heating the egg in the stove and gently wiping off the melted wax, or by briefly dipping the egg into boiling water. N.B. The eggs are never blown or boiled and must be fertile, ideally the first from a young hen. To stray from this could bring infertility and bad luck. Pysanka continue to be made in modern times; while many traditional aspects have been preserved, new technologies are in evidence. Aniline dyes have largely replaced natural dyes. Traditional styluses are still made from brass and wood, but modern versions offer built-in, heated wax reservoirs and a choice of profiles for your dots and dashes…. You can easily book a place on our Egg Decorating event on Monday 26th March – just prior to Easter and in time to ward off any bad spirits. Places (10 available) are reserved through our website, here. We are so lucky to be based in Herefordshire, which we maintain is the most beautiful and interesting county in the UK. So to start the year we began listing on our website what happens in this area on an annual basis. 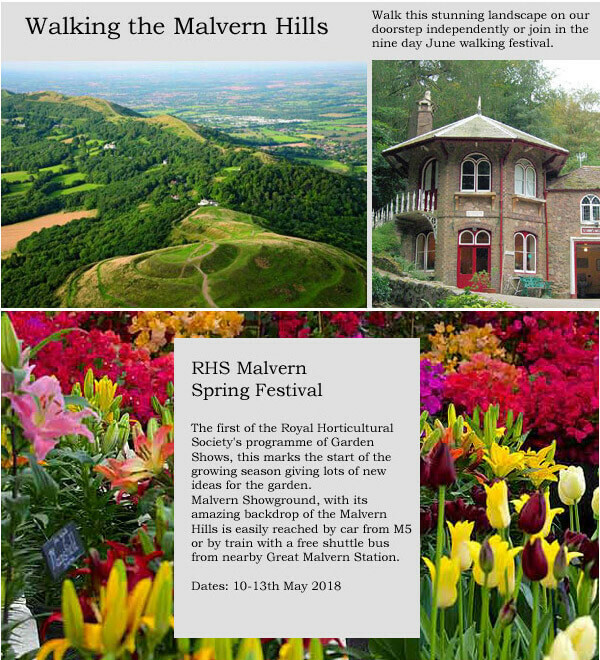 Then, because this year we are having a break from temporary exhibitions, as we are organising some talks, workshops and demonstrations in their place we also wanted to list these too. Here are some to give you a flavour – you will find more details of these on our website. 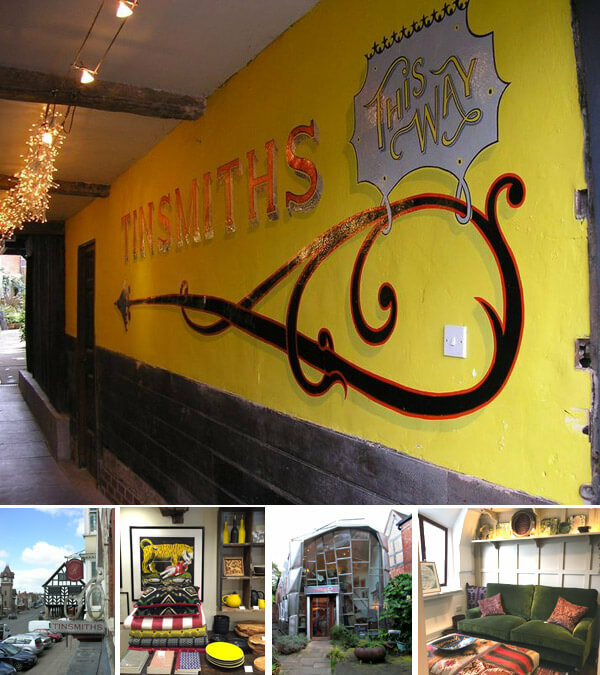 If you like what we like and have never visited Tinsmiths in Ledbury, why not book a break in the area and come and see us? To help find places to stay we’ve been making a note of some of the nicest hotels, b & b’s and holiday homes. You’ll find these on our site too. 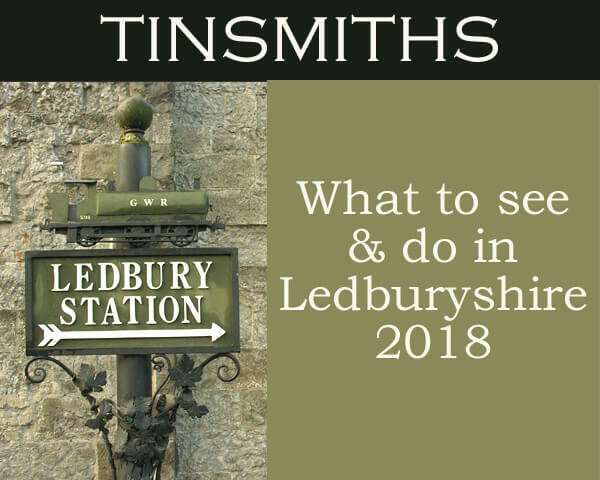 Have a holiday in Ledburyshire – it will be the first of many……. 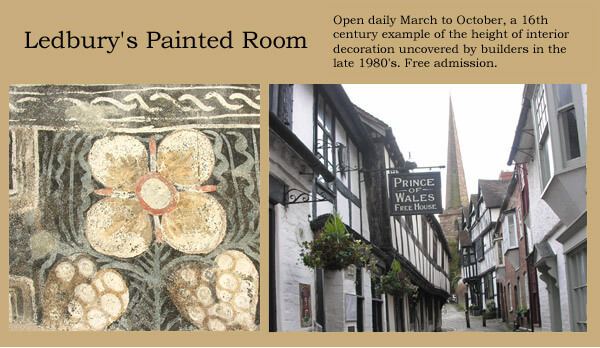 …….and don’t forget to come and see us in Ledbury High Street, (Tues-Sat 10-5pm) during your stay. 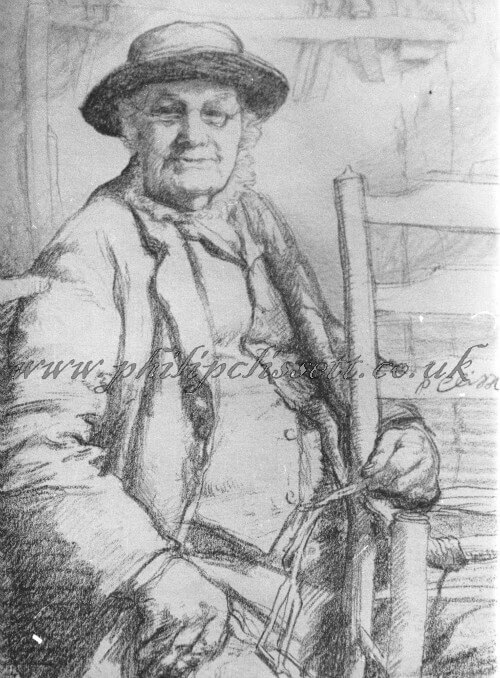 Exactly two hundred years ago, Philip Clissett was born in Birtsmorton, Worcestershire, into a family of chairmakers. He was to become, arguably, the best known of all English rural chairmakers because of his association with the Arts & Crafts Movement. He was born in 1817 during Jane Austen’s lifetime, and lived long enough to take a ride in a motor car, and to see aeroplanes fly. Those who knew him remembered his rosy face, and that he said “thee” and “thou” in the old way. When the Arts & Crafts architect and designer Alfred Powell visited him in 1903, he felt Clissett gave him “quite a glimpse of what the old aristocratic poor used to be”. The drawing of Clissett was published in 1898 in a prestigious arts journal, and captures something of what Powell expressed in words. Philip moved to Bosbury, near Ledbury in Herefordshire, in the early 1840s, and there he plied his trade in rural obscurity. 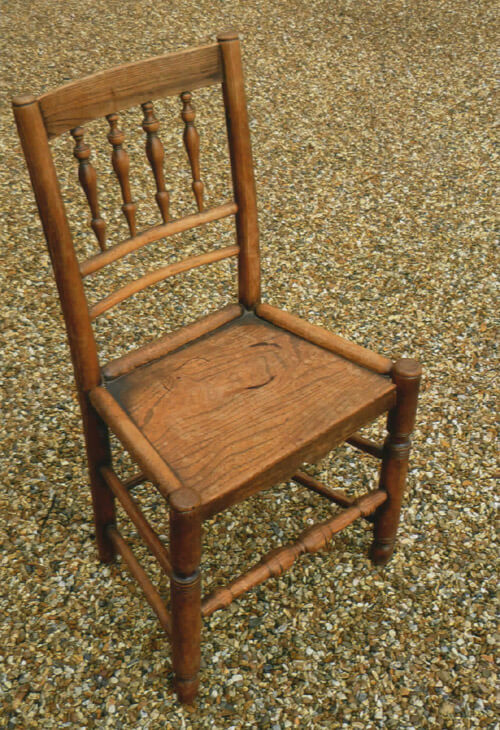 His chairs were made from green ash on a pole lathe and shave horse, and he produced a wide range in the local style, with both the distinctive West Midlands board seat and with rush seats. There were two other chairmakers in Bosbury, and several others in nearby Ledbury. But from about 1860 onwards, vernacular chairmaking of this kind declined dramatically because of the upsurge in factory-made seating so that, by the 1880s, Philip was the only chairmaker left in the area. Then, in 1886, the Bosbury chairmaker was “discovered” by the Scottish architect James MacLaren who was working on a project in Ledbury, Herefordshire. 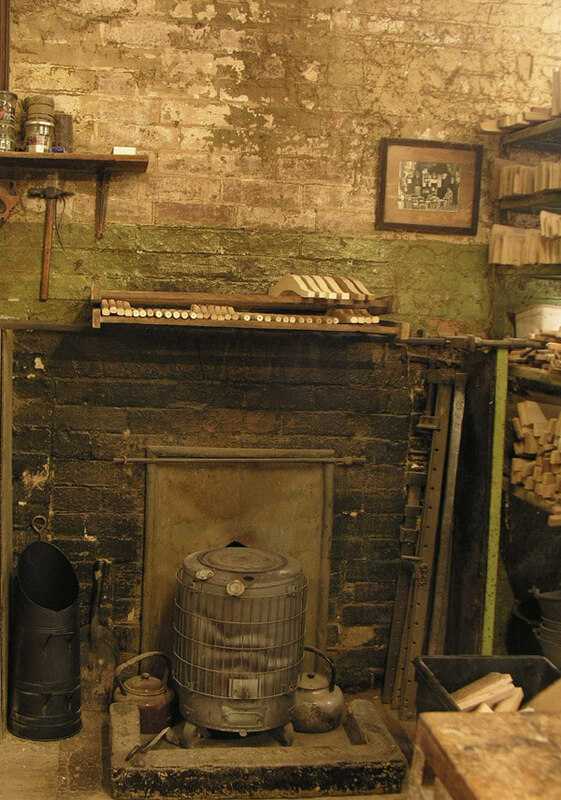 While out for a walk, he came across what his companion later called “a real survival of village industry”, Philip Clissett’s workshop. MacLaren asked Clissett to make him some chairs, having made some drawings that were “improving a little upon his (Clissett’s) designs, but perfectly simple and in the old spirit”. A couple of years later, the recently-formed Art Workers Guild was looking for chairs to furnish its meeting room, and MacLaren (an early member) appears to have introduced Clissett’s new ladderback chair, for it is these we see in the earliest photographs of the Guild’s meeting room in Barnard’s Inn (1892). 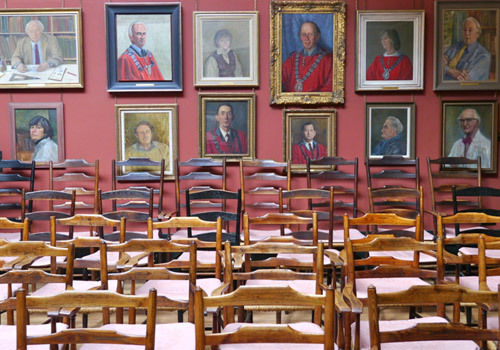 Over a period, the Guild bought many of these chairs, and they are still used in their Meeting Hall in Queens Square to this day. Many members of the Guild, and others interested in the Arts & Crafts style, bought chairs from Clissett, and they were used extensively by various Arts & Crafts architects, especially by Raymond Unwin and Barry Parker, and even (it seems) by Charles Rennie Mackintosh. Philip Clissett was, essentially, a living embodiment of the values of the Arts & Crafts Movement; a time-served craftsman, happy in his work making honest furniture from basic materials with simple tools. The sight of the chairs at the Art Workers Guild inspired the young Ernest Gimson to visit Clissett in 1890, and to spend a few weeks at Bosbury learning how they were made. This experience prompted his own turned chair designs and, from about 1903 until the First World War, he developed a range of rush-seated chairs that were made for him by Edward Gardiner. Although Gardiner abandoned his workshop at the outbreak of war in 1914, he began making Gimson’s designs again, and included a close copy of Clissett’s ladderback chair in the range on offer. This model continues to be made today by Lawrence Neal, the son of Gardiner’s apprentice. It’s still known as “The Clissett”. Philip Clissett died in 1913 at the age of 96. 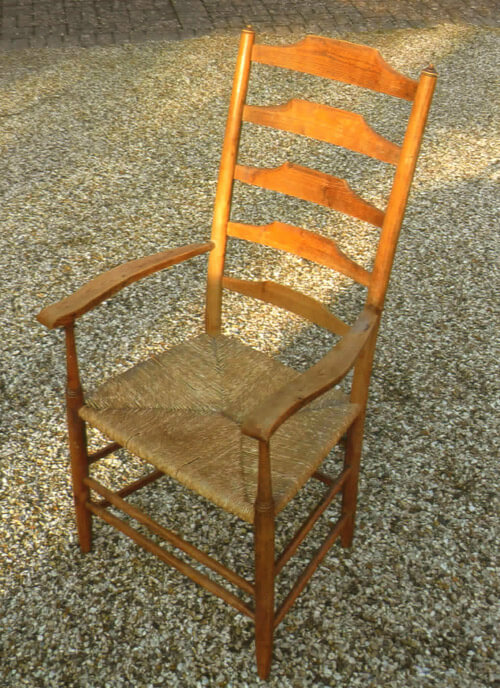 His grandsons, who had continued the business once Philip was too infirm (he is reputed to have made chairs into his nineties), carried on until the Great War put an end to chairmaking in Bosbury. They never made chairs again. Philip’s interaction with the Arts & Crafts Movement, and the continued popularity of his ladderback chairs, ensure he is remembered to this day. Sadly, James MacLaren, the designer who made it all possible, is rarely acknowledged as his iconic chair design is frequently, and mistakenly, credited to Ernest Gimson. Together, they have inspired a whole new generation of chairmakers. 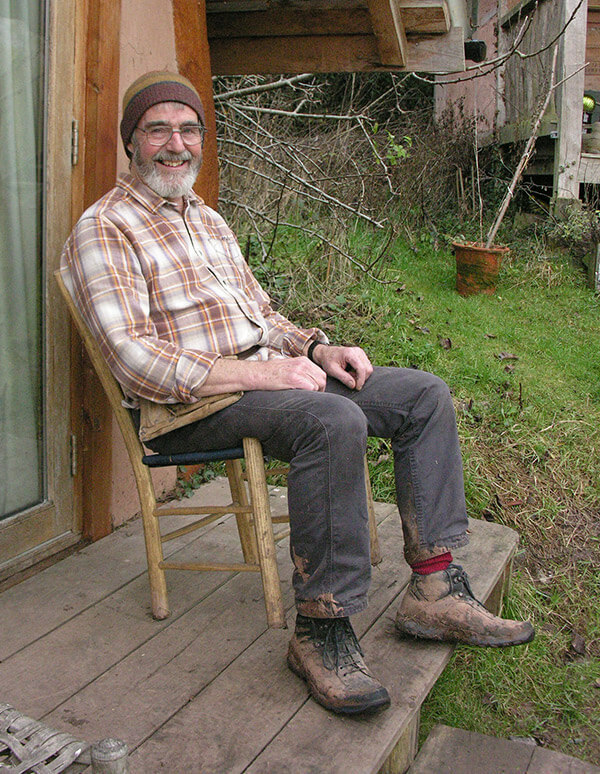 A sweet, hay-like smell hits you as chair-maker, Lawrence Neal, answers his door. The door opens in to what appears once to have been Victorian Schoolroom, but was in fact the village co-op store. Neville Neal, Lawrence’s father moved his furniture workshop to this large, light room in 1960. A glance around identifies the parts – parts of chairs carefully grouped, tools equally. 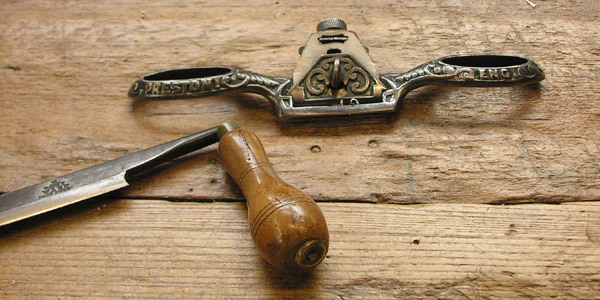 Handsome, solid machinery to cut and shape and the source of that sweet smell. As Lawrence’s recently lit wood stove cranks up the heat the bundles of rushes stacked in a corner warm. “It’s not my favourite job, but just once a year I pull on my waders and harvest the rushes from the Avon”, Lawrence tells me. 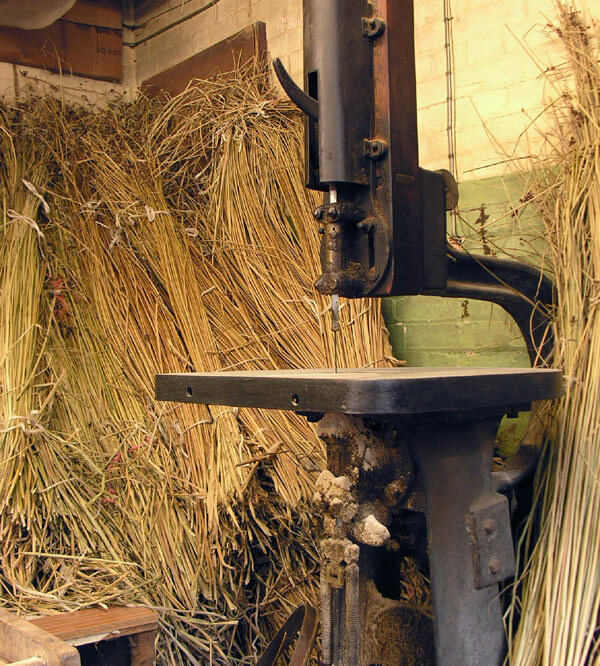 To understand how Lawrence arrived at his chair-making career we need to take a few steps back in time to the early nineteenth century: then country chair-makers (usually called bodgers) were common. Philip Clissett (b.1817) was one of the longest lived of these. In 1890 architect, furniture designer Ernest Gimson took lessons from Clissett and over the next thirty years this experience influenced his designs. Gimson became an important part of the Arts and Crafts movement and established a furniture business in Gloucestershire. 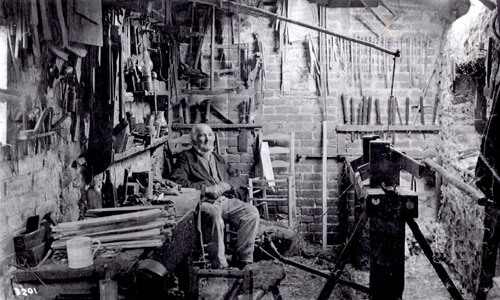 Gimson encouraged a young, local man to take up chair-making. Edward Gardiner worked with Gimson and, after the First World War, set up a workshop in Priors Marston, Warwickshire. 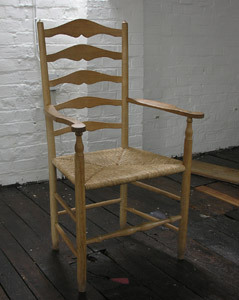 Neville Neal, Lawrence’s father, became his apprentice in 1939 and took over the business after Gardiner’s death essentially making chairs which can be traced back to Clissett. Here we are in 1966 with a busy chair-making business run by father with son, Lawrence, as apprentice. As the maker at the top of a “family tree” of chairmakers, I asked Lawrence whether any other career had been in the frame, “Not really, it was just assumed. I had been in and out of the workshop throughout my youth and when I reached 15 years it seemed natural to learn more”. Neville Neal died in 2000 & Lawrence has worked on his own from then on, making spindle and ladderback chairs with rush seats. Now, at close to retirement age, Lawrence really doesn’t know what else he would do with his time “There’s only so many times you can re-decorate the house”, he laughs. Neville Neal was fortunate to have a child disposed to precision and constancy. 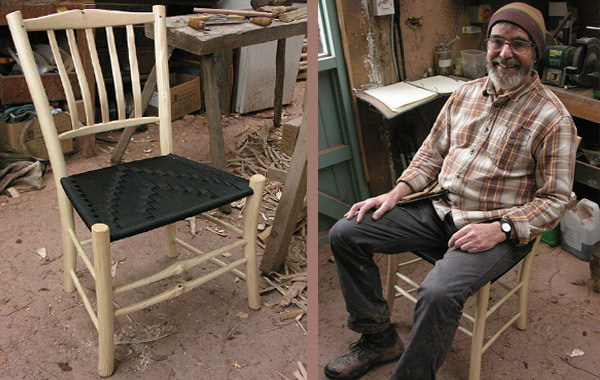 Lawrence’s working life has a rhythm and regularity that few experience – he selects a year’s supply oak and ash and harvests enough rush to complete the seats for the 120 chairs he makes annually. His machine tools are circular saw and lathe, his hand tools include cleaver, axe, chisel, draw knife, clamp and spokeshave. In addition he bends wood using something akin to a burco boiler. Glancing at the many patterns for chair parts hanging on the workshop wall, Lawrence points out several that he believes began life in Gimson’s furniture workshop. “The designs haven’t really changed, I still make the chairs made by Clissett, Gimson, Gardiner and my Father.” Once you familiarise yourself with these designs you realise why the designs are so constant. The chairs are honest and so well worked out – just the right structure for their weight and purpose – nothing can be added or taken away to any advantage in function or look. Working from the Wood, an exhibition celebrating the bi-centenary of the birth of Philip Clissett runs from 29th June to 30 July 2017 at Tinsmiths, Ledbury. It features Lawrence Neal’s chairs. Other exhibitors, also influenced by Philip Clissett, will be Koji Katsuragi, Sebastian Cox, Mike Abbott, Gudrun Leitz and Neil Taylor. 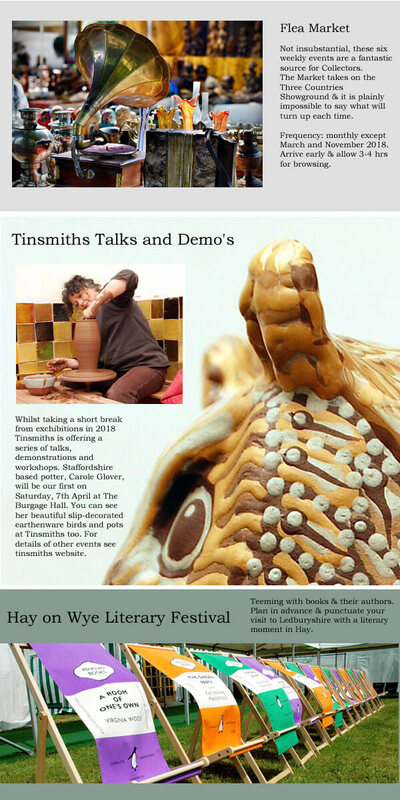 Please contact press@tinsmiths.co.uk with your name and postal address if you would like to be sent an invitation to the opening. Mike Abbott will be giving a talk on Philip Clissett on Saturday, 15th July at 4pm at The Burgage Hall, Ledbury. Tickets will be made available at www.tinsmiths.co.uk from 1st June 2017. 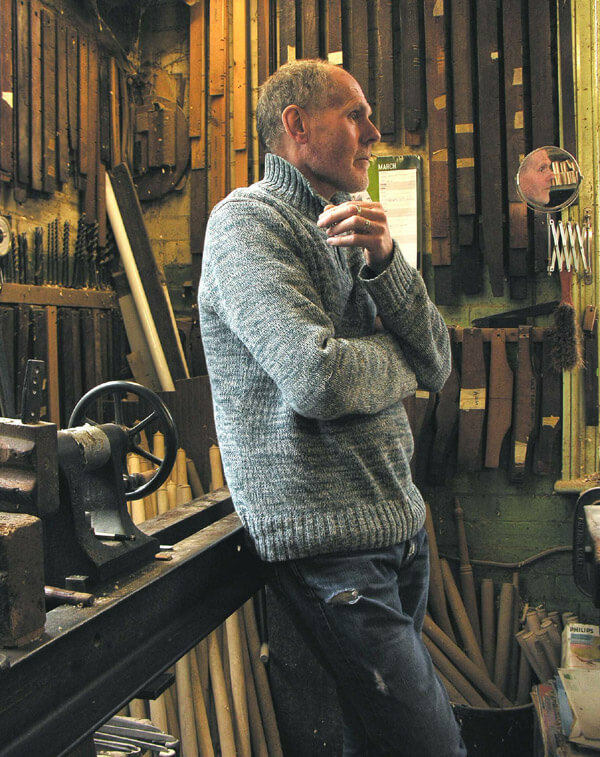 “I tried retiring in September 2015 – that lasted about six weeks” laughs Mike who has spent a lot of his working life teaching hundreds of people via his courses and thousands via his books about how to make chairs using greenwood. 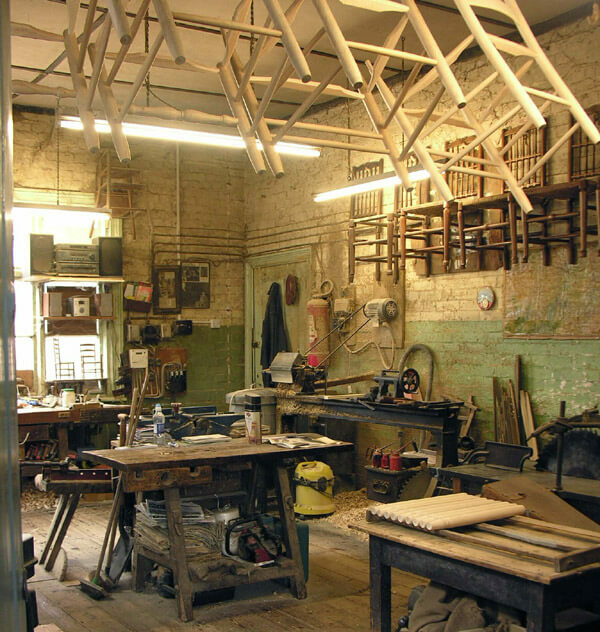 Jointly founding The Clissett Wood Trust in 1994, Mike worked and taught in the wood, which is close to Ledbury; there he predominantly used a pole lathe to make traditional chairs, in much the same way that Philip Clissett (1817-1913) had in his workshop at Stanley Hill, near Bosbury. 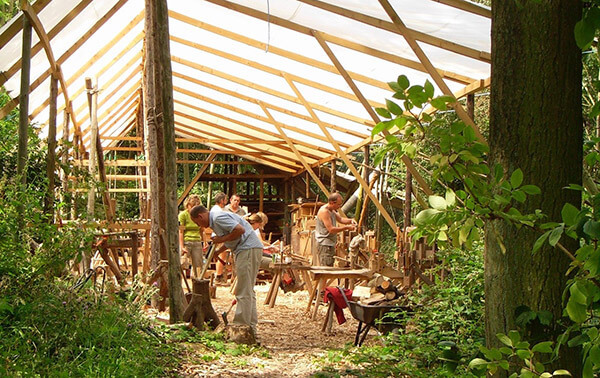 Later he established a woodland workshop at Brook House Wood, near Bromyard and continued to run courses in the wood from 2005-2015. 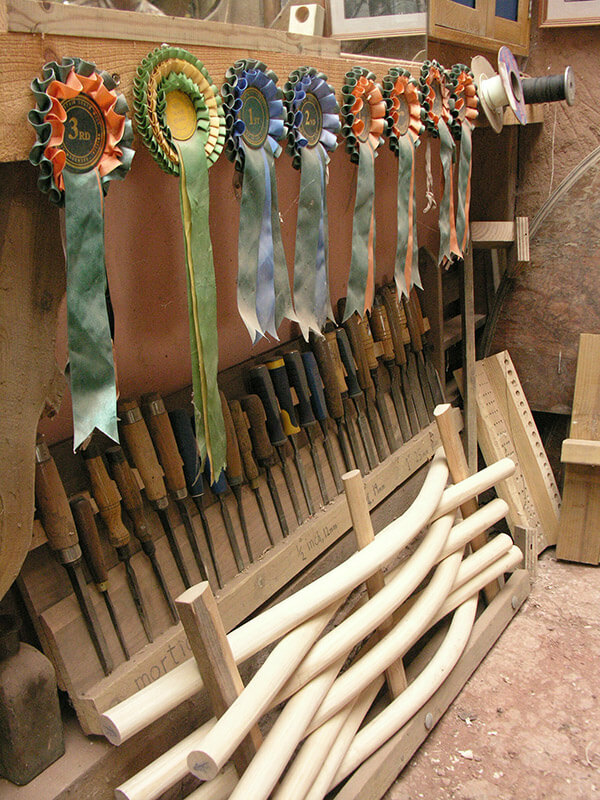 “Nowadays it’s all about this – the cleave” explains Mike as he splits oak in his workshop to shape on the shaving horse – a traditional device used for gripping a piece of wood, leaving both hands free to use a drawknife to shave the wood. Later, he shows me cleaving on a large scale with a large section of oak. Mike was first inspired by the bodgers who worked in the woods of the Chilterns, turning in vast numbers, the components for Windsor chairs. “These days my influences lie further West, in America and in particular with Walden,” Mike explains. In his twenties, he came across a book entitled ‘Walden or Life in the Woods’. The author, Henry David Thoreau, a 19th Century American philosopher undertook a two year experiment to live simply in a self-built cabin in the woods. This encouraged Mike to accept an invitation to visit the USA in 1993, where he was influenced by the chair-makers of the Appalachians, who left their chairs with a simple shaved finish, rather than the more sophisticated, smooth turned finish. On the rebound from retirement, Mike has set himself a challenge. To make and document 100 chairs – a sort of limited edition, each one branded with its number. He’s already on number 21 so he may have to come up with another goal. With enthusiasm, Mike shows me his latest passion the “Settin Chair” a low frame chair with woven seat and steam-bent uprights forming the back rest. I don’t immediately “get it”. I need a demonstration. We step up the garden to his latest timber-built space, and puts down the chair in its “Out West” natural environment, the veranda. He leans back (in just the way that youngsters in formal dining rooms have been warned against for generations) in a casual, end of day, way. That’s Settin.